The first thing I learnt about wildfowling is that you need to be an early riser. My days of waking with the sun are long behind me and I have never worked a night shift, so heading to bed at five o’clock in the afternoon for a 12am start was the first of many new experiences to be undertaken as part of my first trip onto the marsh. Wildfowling is not something I have much experience of, as much by virtue of living some distance from the coast as anything else. Also, I have always considered shooting to be very much a social activity, and wildfowling is by its nature a solitary pursuit. It must be said the idea of loading myself up with layers of camouflage clothing, exotic ammunition and vast strings of decoys to sit in the mud for hours on end also didn’t appeal. Moreover, I couldn’t believe that this facet of the sport could be as special as its proponents insist. Whether read in magazines or heard in conversations in shoot rooms up and down the country, wildfowling is considered by many to be the most ‘real’ form of shooting, and very often the best. No doubt it is the form of shooting closest to nature, the birds being very definitely wild. 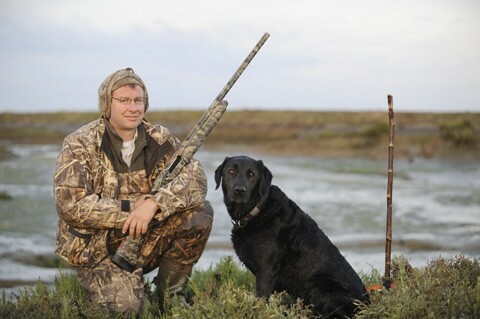 Martin Batt, secretary of the Blackwater Wildfowlers Association, and his dog, Jasper. However, during the course of my few short hours on the marsh with Martin Batt, secretary of the Blackwater Wildfowlers Association any preconceptions I had were shattered. 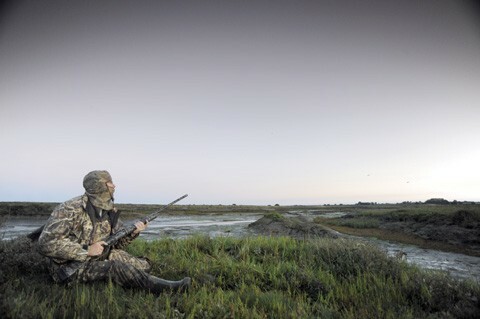 The somewhat mysterious nature of wildfowling is due in no small part to the time of day which it occurs. Like a scene from a low budget thriller, photographer Bob and I met Martin in the dead of the night on September 1, the opening day of the season, outside of a pub in the quiet village of Goldhanger in Essex. A short drive down bumpy farmland tracks nearby took us to within a mile of the Blackwater estuary, and from there it was a brief starlit walk out to the sea wall and the salt marsh. 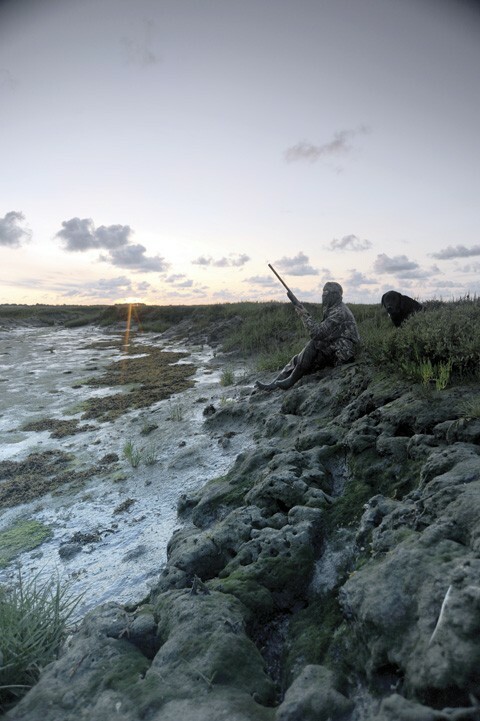 The Blackwater Wildfowlers Association was formed in 1960 to formalise and protect wildfowling opportunities and to conserve the coastal habitat of the Blackwater estuary. Boasting around 60 members, including punt gunners, the Blackwater Wildfowlers Association owns and leases land on the River Crouch and the River Blackwater. Much of their land is managed for conservation, benefiting summer breeding and winter feeding of waders and wildfowl. My wildfowling education began before we even started the walk to the marsh. Fearful my lack of camouflage clothing would put me at a disadvantage, Martin assured me normal shooting clothes in muted colours were fine for the task ahead, his only recommendation being to bring a stout pair of waterproof trousers and a hat large enough to cover my face. The foreshore at dawn is quite a sight to see. Being a keen wildfowler Martin had all the gear, including a complete camouflage suit and balaclava, camouflaged Winchester semi-auto shotgun and a handsome and steady six-year-old black labrador named Jasper. The conditions were clear and dry, and the sky’s population of stars watched over our steady progress towards the shoreline. Beautiful though the night was, it was the sound of the world around us which made the hairs stand on end. There was absolute silence except for the hiss of escaping breath and heavy Wellington boots on gravel and dirt. Long dirt tracks soon gave way to shingle crunching underfoot and lapping water. My reverie was only broken by the first sign of human life in the distance, regular arrangements of bright lights low on the horizon marking out the high walls of Bradwell power station. Soon Martin stopped, and we headed up onto the marsh looking for a suitable patch of land on which to wait. Here he unveiled a short line with two weighted decoys attached, throwing them out into the retreating water to catch the eye of a passing duck. “It’s amazing how even a couple of decoys can attract a duck’s attention,” Martin noted. Indeed, successful wildfowling requires a good grasp of fieldcraft. Knowing the best places to hunt and how to reach them safely come with experience, which is why all new members of the Blackwater Wildfowlers Association are taken out onto the marsh with experienced members at least twice before they are allowed out on their own. Much like I was, they are shown entry and exit points, the boundaries of the Blackwater Wildfowlers Association’s land, and helped to understand how the tide affects the marsh. Another pillar of the sport is quarry identification, which again is tested before new members are allowed to shoot alone. “You must also be able to recognise the shapes and plumage of various birds, and then think about how to get them into range. You could see a whole load of duck, but if they’re 50 yards away they might as well be a mile away. The key then is moving towards them without giving yourself away and scaring them off. While all this camouflage gear is good, you really just need to move slowly and keep a low profile. Our spot chosen, we sat and waited, listening to the ground popping and crackling beneath us as the estuary drained with the tide. The silence was broken by the call of curlew, the braying quack of a female mallard or the distant honking of geese along with a myriad of other bird life. Before long it seemed we had been surrounded. As my eyes adjusted to the half-light, I began to notice the small details of the world, such as the ripples being pushed into the water by the breeze and the shapes carved into the mud as the estuary drained. Martin and Jasper sat with a remarkable stillness as we watched birds flying tantalisingly across our path. The noise of the birds chattering was intoxicating. I had become lost in their early morning chorus when Martin took the first shots of the season. Within just a couple of hours the estuary had almost totally drained and the sun had begun to climb. A pair of mallard had flown into the marshes from behind us, coming in quickly over our heads. They were greeted by flashes of light, a roar and a hiss, as Martin fired two cartridges. Jasper strained against the dark, his eyes staring meaningfully into the distance, waiting for a sign of fallen birds. Alas, there was to be no work for him on this occasion. The marsh, though, erupted in alarm at this rude intrusion, birds of all types voicing their disdain for the noise. But within moments they had settled back down to their familiar chatter. The few clouds had seemed to turn a foreboding black as a silvery light from the east began to push back the night. Lurid pink behind a bank of trees turned to amber as the sun loomed large on the horizon. 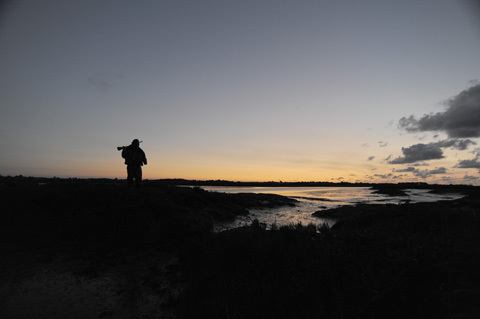 Shots echoed up and down the estuary from the other keen wildfowlers who had staked an early place. The peak time for wildfowling is an hour either side of sunrise, and though we did not have any successful shots in that time, it was a genuine privilege to see the world in its new light. After this burst of activity the second part of the morning’s shoot, and the most unexpected one for me, took place. Mallard were flighting far off in the distance and great skeins of geese flew low to the estuary all around us, tempting but out of reach. The birds were wild and wily enough to keep their distance. I had imagined wildfowling was a static sport, a waiting game played much like pigeon shooting. But hearing his quarry somewhere in the distance, Martin decided it was time to go on the hunt. He rose slowly to his feet and with Jasper at his side, moved quietly off further out into the marsh. Shots continued to sound out from other wildfowlers, but for all Martin’s hard work he did not get another opportunity. But that is the nature of the sport, and on this bright, clear morning it did not matter at all. “Wildfowling is 99 per cent anticipation and one per cent exhilaration,” Martin told me as we walked back inland. And he was absolutely right. Though I hadn’t pulled the trigger, this trip out onto the marshes had been a wonderful, evocative sporting experience every bit as special as I had been told.